Congratulations to senior Lina Al Hashimi for receiving a bronze medal in Medical Math at the SKILLS USA state competition. Students in the National Honor Society weed and mulch the marquee at the corner of Washington Blvd and Stafford St. Their efforts are part of W-L's Greening the Grounds initiative, in which clubs and groups adopt areas of the school grounds to maintain. 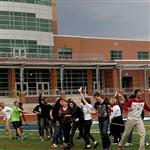 Students in Ms. Liller's chemistry class participate in atom tug of war, a hands on demonstration of polarity. 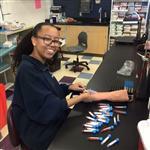 Students in Mr. Brodowski's IB Biology class visited a cadaver lab and practiced drawing blood. Emnet won the contest for fastest lab tech! 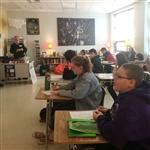 Dr. Andrew White engages Latin III students with tales from the Roman Republic. 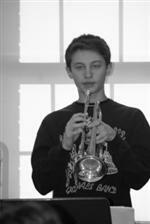 Congratulations to junior Micah Reinharz for being selected as one of only 24 high school trumpet players from across the country to participate in the semi-final round of the National Trumpet Competition. This competition will take place March 10-12 at Columbus State University in Columbus, Georgia. Way to go Micah! Students and families can visit vosphoto.com/washingtonlee to order photos from end of year activities including prom and graduation. As part of Distracted Driving Awareness Month students signed a pledge to drive without distractions and encourage others to do so, too. Click here to see a list of students who made the pledge. 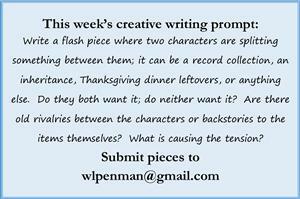 All students are encouraged to take part in the weekly writing prompt. There will be a new prompt each week. There is no minimum or maximum number of words. Just respond! Responses may be featured in Penman, W-L's literary and arts magazine. Receive the latest news and updates regarding MacBook Airs at Washington-Lee using Remind. Remind delivers either text or email messages directly to your chosen device without providing your personal contact information. Subscribe by texting @macbookair to 81010. Families can now access student schedules, class attendance, grades, and report cards through ParentVue and the Family Access Center. You can reach the Family Access Center through W-L's Site Shortcuts, the W-L Parents tab, or the APS website Parents tab. Click here to link to a brief instruction guide on some of ParentVue's functions. Information about ParentVue was mailed home in August. To create an account and log into ParentVUE, you need a valid email address and the Activation Code provided in the letter that was sent to you. Then follow the steps in the letter to register and set up your password. If you did not receive a letter or misplaced your Activation Code, you can email W-L's registrar at debbie.germosen@apsva.us. For other technical questions, please visit the Help Center at http://access.help.apsva.us or contact the Help Center by email: access@help.apsva.us or phone: 703-398-1426 or 703-228-2994 (Monday-Friday 6:30am-6:00pm). Looking for something to show off your Generals Pride? Click on the image below to visit the Generals Apparel Shop. There is something for everyone! APS invites families to visit apsva.nutrislice.com or download the Nutrislice App to find lunch menus, get nutrition information, see carb counts, and view allergen information. Academic Support is available during zero period, lunch, after school and at Saturday Academy. For more information/details, please click here (aquí). Students can also access support during Generals Period.